I hope that all of you had a quality Memorial Weekend. I was pleased to see that so many people reflected on the true meaning of Memorial Day as well, including many of our students and your people. Never forget. West Genesee was represented very well as usual at the Memorial Day parade in the Village of Camillus. Even though I was out of town, I was able to follow all of the action on Twitter which I found ironic as people are usually following ME on Twitter to stay updated. We continue to have a banner sports season and spring sports for many are still moving forward. There are so many results to report that I am going to refer you to this link so I do not make a mistake and accidentally leave something out. I am very proud of our student athletes, their coaches, and Athletic Director Mike. Burns for proceeding through this season with commitment, class, character, and a competitive fire. Best of luck to those athletes heading on to state competitions this week. Also, just a friendly programming reminder that this Sunday (June 3) is the first run/walk sponsored by the group Save Modified Sports at West Genesee. The event promises to be a lot of fun for all with a faculty softball game at the end with actor Alec Baldwin as the umpire, and a band that will be playing some of your favorite classic rock tunes. If I survive the race, I plan on sitting in on the guitar for a few tunes as well. I hope to see you there and for additional information head to their website at Savemodifiedsportsatwg.com . If all goes well, we may be paid a visit by Dr. John King, the Commissioner of Education for New York State. He had requested to view a high functioning Career and Technical Education program and West Genesee made the very short list. We completely understand his busy schedule and hope that he can make it, but if his plans change at least we were one of the first schools on his mind. Have a great rest of this short week! You know you are from Syracuse when...you can't stop talking to people about how nice the weather is. True enough, some awesome weather crept into town last week and has decided to stay in Central New York for another week or so. For students at West Genesee Middle School this nice weather gave them and their teachers an opportunity to participate in their own interdisciplinary lesson about the Greek Olympics. These games are always a blast, but students also walked away with better knowledge of how things happened "back in the day". I had a great time visiting buildings last week. There is something to be said for sunshine and warmer temperatures. It makes everyone more pleasant and it was fun talking with students about what they were planning to do over the weekend. Most of their plans included outdoor activities which I thought was great. Also last week was our annual school budget vote. Thank you for your continued support of our efforts. Our passing margin of nearly 83% symbolizes your willingness to continue to endorse the initiatives set forth in our Strategic Plan, and we most certainly will not take that support for granted. This week is jammed with events, functions, classroom visits, testing, and preparation for a long weekend that for us kicks off with our annual Fine Arts event, Kaleidoscope, which takes place at the Civic Center. It truly is a special event that allows our students to show off their talents in a nearly break free show that uses the stages, pit, mezzanines, and any other place that we can get a spotlight to shine! On the athletic side of the coin there are plenty of options as well. Mr. Burns, our Athletic Director, is really getting a chance to enjoy his first year in the position as many of our teams have won their League Championships, Sectionals, and States and this spring sports season is setting up to possibly be one of our most successful seasons in a while. With so many teams heading into sectional play, please refer to the athletic page of the website to see when and where each of the contests will be played. Good luck to all! As you might know, students do not have school this Friday, or next Monday and Tuesday due to "give back" days related to unused snow days. These extra days CANNOT overshadow Memorial weekend or Memorial Day. This weekend is a time to remember those who have sacrificed their lives so that we can have all of the basic freedoms that we enjoy today. Please take an opportunity to thank a Veteran or a family that has lost someone, they will really appreciate it. Please remember the fallen. Thank you. Here's to a great week ahead and I will write again after Memorial weekend. I hope that all of you had a wonderful weekend. It is so rare to get a weekend this nice but I am sure that many of you are glad to be at work to get some rest from all of the things that you accomplished! 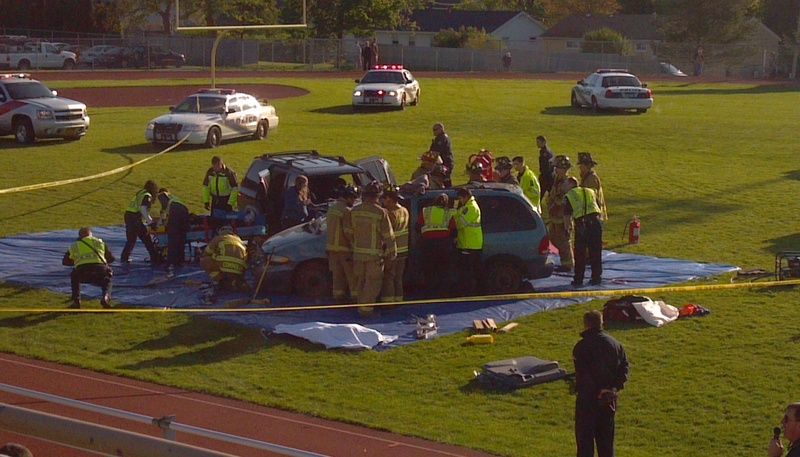 My weekend started off with a very powerful DWI crash simulation at our high school. 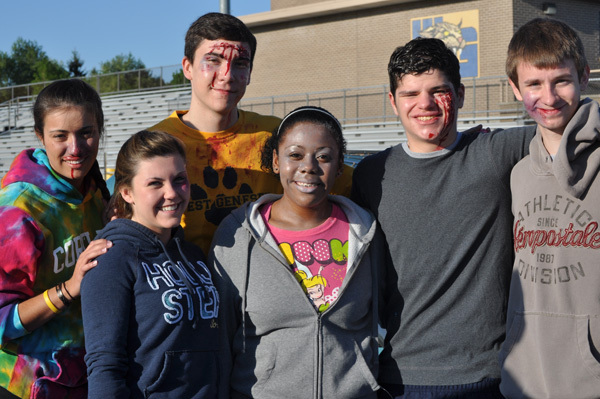 This simulation was created with emergency professionals from our community and county who all helped to portray an authentic experience for our juniors and seniors so that they will think twice before making a poor decision related to driving. The student actors and actresses were also a powerful piece of the equation as classmates see their friends in situations that happen when poor decisions are made. We also invited parents and any community members to attend. The reactions to the simulation by all were shock, sadness, dismay, and the overwhelming urge to do what is necessary to help students to make the right decisions while driving. Click here to see pictures from this powerful event and thanks to all for making it a success. Friday night was a blast. My wife and I had the privilege of attending our eighteenth Senior Ball together and it was a very special night. The Ball had a Hollywood theme and began with a great entrance way, some awesome food, and plenty of dancing. After the last song students made their way to the high school where dozens of parents and staff hosted an All-Night Party with plenty of cool things to do. As usual, the hypnotist was the hit of the night. Our students were incredibly polite, respectful, and mature. Thanks for a wonderful evening. I hope that all of our mothers had a great Mother's Day weekend. I would like to congratulate my wife for graduating from Syracuse University with a Masters Degree, modeling that moms have super powers that allow them to somehow work full time, take care of the kids (including me), take care of just about everything else, AND go to school. A tall order, but she and moms in general make it look easy! Thanks to all of the "moms" out there. Please remember that the school budget vote is this Tuesday from 6:00 a.m.-9:00 p.m. at the high school auditorium. It is critically important to hear from you about how we are running your District, and I hope to see you on Tuesday. Thank you for your continued support! Yesterday I completed my first "Mountain Goat" run that took place downtown on a perfect Syracuse day. The 10 mile run represented the longest distance that I had ever run. Last year at this time I could barely finish the 3.5 mile Corporate Challenge. So even though friends, co-workers, and others passed me today on the way to the finish, I was okay with how things turned out. From last year to this year I changed my diet, ran many training runs, and overall, just tried to stay in shape. Coming across the finish line I realized that I just could not have done any better, and I sensed a bit of frustration in a way because a few people I knew did not train, did not adjust their diets, and still finished before I did. In other words, I tried my absolute best and finished in the middle. It reminded me how our kids must feel when they find themselves in situations where they give maximum effort, but do not see maximum results (in their and/or our eyes). As an adult it is much easier to deal with that feeling, but kids sometimes find a mental fork in the road where they either stop trying so hard or try even harder and possibly end up with the same result. This can be a tough choice for a student or child to make. This makes it very important to celebrate little victories with our children and not just wait for the "big ones". In the past some would call this approach weak but that was way before anyone thought about equally meeting the needs of ALL students; a time that I remember as a student myself. While I will be working to shave ten minutes off of my race time next year, let us all remember to take ten minutes to sit with our kids and instead of just looking at a grade and moving on, probe a little deeper and find out how they prepared and their effort level to get that grade. You might be surprised. This week is just absolutely crazy. I sometimes wonder if Mr. Davern and Mr. Burns (Fine Arts and Athletics) have roll away beds as they will be out absolutely every day and night this week (and next) as we wrap up spring sports and concerts. Dr. Copeland and his crew at the high school are preparing for our Senior Honors Reception on Wednesday night which will feature small foods and desserts as opposed to the full dinner that had been served in the past. I am looking forward to this event as I have really developed a relationship with this class (they were Freshman when I arrived in 2008) and it will be equally tough to lose them to graduation in a month. On Thursday night we will be holding our final committee-centered redistricting meeting at East Hill Elementary School at 6:30 p.m. The consultants will be working the committee through the DRAFT of their final recommendation report before making a presentation to the Board of Education on June 6. I have been asked how many families are going to be affected IF the Board ultimately chooses the recommendations of the consultants/committee. After taking a close look, it appears that a maximum of 172 families could be impacted. I say could because out of the 172 families in the areas that may be impacted we do not know how many of those families have students in grades 7-12 that would be impacted. This number of families represents about 5% of the overall number of families with children in the District. I have also been asked if the District will consider any type of waiver for students who are in 5th or 8th grade when any changes take effect. Once the Board of Education chooses a path (if any) we will break it all down, see how many students at these grade levels might be impacted and may consider waivers, etc. Without having a definite direction, that is about all I can say at this point. Lastly, but certainly not least, our Senior Ball is on Friday night with an all-night party at the high school taking us into the wee hours of Saturday morning. During the day on Friday, law enforcement and emergency response volunteers will be conducting a simulated DWI crash to our juniors and seniors in the back of the high school. We will be sure to have this simulation clearly marked on our sign, and we will remind you via Facebook and Twitter. Pretty light week huh? Have a great one.